Their next work Kluster Zwei: Osterei was constructed In the same way as its predecessor, recorded live on 23 February 1970. This time the lyrics (poems) on side one were read by a male, Manfred Paethe. Both albums have a remarkable technical quality considering their age, courtesy of Konrad Plank. They are milestones in the development of German electronic music. Schnitzler occasionally performed live with Tangerine Dream, until September 1970, when he was re-united with Roedelius & Moebius for Kluster's first live appearance at a pop festival in Fehmarn. He then returned to Berlin and his forthcoming Eruption project after a final Kluster live performance in Gottingen, May 1971. Moebius and Roedelius continued their work as a duo, but they changed the letter 'K' to 'C' to mark Schnitzler's departure. Their next album was in fact already finished by then. Cluster was recorded in Hamburg in January 1971. This time Plank was also credited as co-composer. Released on Phillips in Autumn 1971, this was their first issue on a proper record label. This time there were no lyrics or poems, but the three pieces included were still untitled, comprising spontaneous and free electronic music, no rhythms, just a continuous flow of ascending or descending sounds. It received great reviews in the German music press and was voted the tenth best album of 1971 in a magazine. The second Cluster album was recorded in January 1972 in the Star Studio, Hamburg, and marked another change of record company, being their first for the Brain label. The six pieces were for the first time in Kluster/Cluster history titled, and it even sounded a bit more planned and structured than before. It was a step closer to what Tangerine Dream would do the next year on their Atem album. Cluster now utilised electric guitars and generated patterns of repeating stanzas. For the rest of the year there was little recording activity. Cluster were busy finishing their own studio in the little village Forst, Niedersachsen. Their successive albums were all recorded there and/or at Conny Plank's studio. Occasionally they performed live at art galleries and museums. Moebius and Roedelius recorded the third Cluster album Zuckerzeit in Autumn 1974 with Rother co-producing. 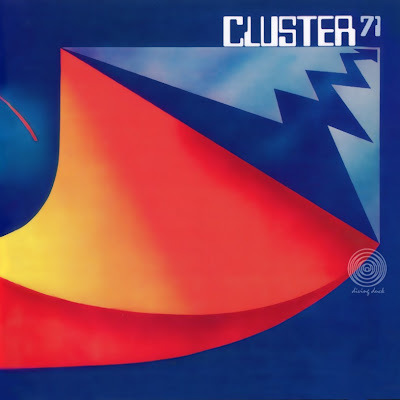 This was a milestone in the history of electronic music, and probably Cluster's most influential album. In contrast to the urbane and cold electronic music (although sometimes romantic in its own way) of Kraftwerk and Tangerine Dream this was a rural, vivacious and often humorous use of synthesizers. What a musical change this was from the Cluster II album! This was the first album to display their individual talents: Moebius' passion for strange sounds and quirky rhythms (later explored to full effect on his solo albums and collaborations with Plank') and Roedelius' charming, tuneful little ditties. With Rother (and special guest Mani Neumeier of Guru Guru) the second Harmonia album De Luxe was recorded in the Summer of 1975. The title track featured some nonsensical lyrics. The music was surprisingly light, far less experimental than the first Harmonia album. One is left with the feeling that the musicians did this more or less as a holiday project. In 1976 Rother started his successful solo career (enjoying instant chart success with the album and single Flammende Herzen), while Cluster recorded their fourth album Sowieso, developing the style of Zuckerzeit furthers seven sweet drops of witty sequencer music, all wrapped in light and pretty colour tones like some aural sweets! 1976 was also the year Cluster did their first collaboration with Brian Eno. This well respected Englishman had always admired their music very much, and met them for the first time backstage in Hamburg in 1974.